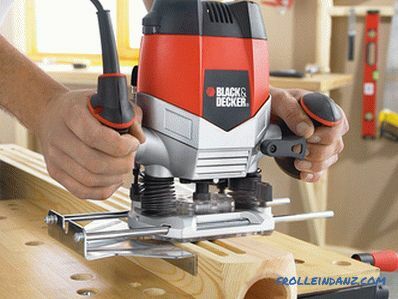 Professional joiners, master finishers and, of course, furniture makers have long appreciated the advantages of a manual electric router and will never give up on this tool. If you are reading this article, it means that you also made a decision to acquire such an indispensable assistant in carpentry-carpentry business and now you are trying to figure out which mill it is better to choose. We will not advertise products of certain brands, but we will try to form a general idea of ​​the tool and give you a lot of practical recommendations. As a result, you will be able to develop your own strategy for finding a milling cutter that is most suitable for solving your problems. Initially, the milling machine was created as a tool for working wood. Plastic, non-ferrous metals, plexiglas, artificial stone, various composites are capable of modern milling cutters, but wood still remains a priority. 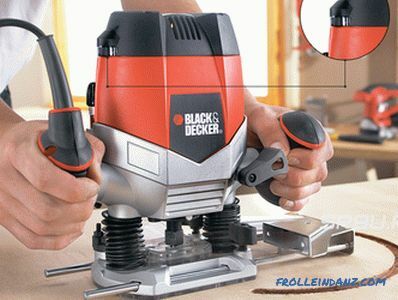 The main use of the router is carpentry, furniture manufacturing and various decorative woodwork. Able to do all the basic milling operations: creating grooves, holes, rounding, chamfering, closed-loop milling, etc. 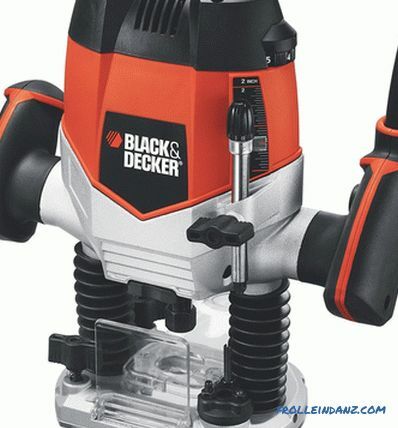 It is used both in home workshops, and in production shops. Performs groove sampling, grooving, chamfering, cutting shallow grooves on the pattern. Able to accurately handle parts covered with veneer or laminate. It is advisable only for daily use, i.e. in production conditions. 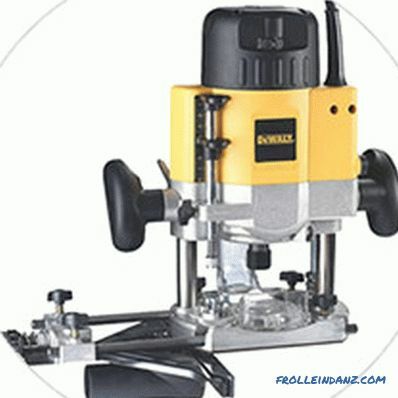 Used for cutting holes in wood, as well as drywall, plastic, and ceramic tiles. Able to handle edges. Used exclusively for sampling slots. 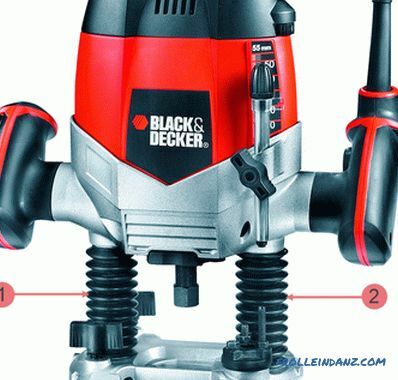 A highly specialized tool for creating paired holes designed to connect parts on dowels. 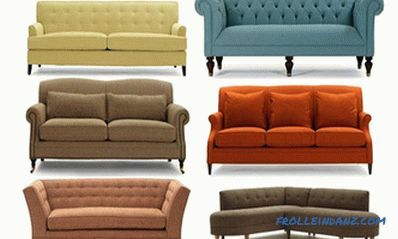 Used in furniture production. 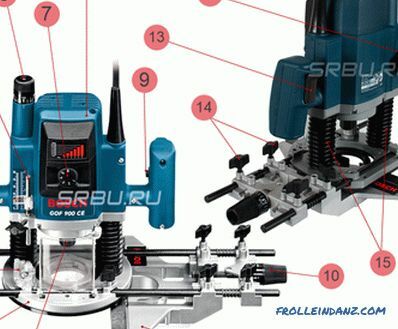 What type of router you need depends on the nature of the tasks before you and their scope. For example, in furniture manufacturing, milling is one of the main operations, but in the home workshop, the need for such an instrument usually occurs only occasionally. The most versatile and most widely used is the submersible mill. First of all, attention should be paid to those who are trying to decide for themselves the question of how to choose a manual router for wood for a house. And it is on this type of router that we will focus here. 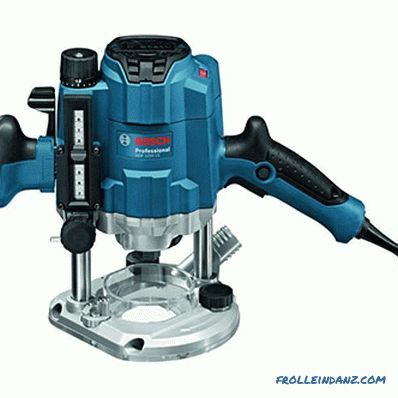 Of all manual power tools, the router is perhaps the simplest from a structural point of view. Its equipment is attached directly to the motor shaft (spindle), i.e. the transmission of torque is carried out without the mediation of gears, belts, etc. Thanks to this, the mill easily gains great momentum. 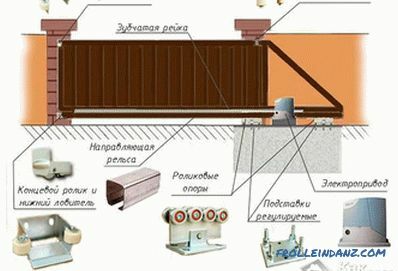 The mill body, also called the “head” or simply the “head”, moves up and down along the guide rods, which are rigidly fixed to the supporting platform. When the operator presses on the handles, the head goes down, when the spring pressure is weakened, it returns to its original position. A milling cutter is attached to the motor shaft (spindle) by means of a collet clamp. When lowering the head, the cutter smoothly sinks into the material of the workpiece to a predetermined depth, the latter is adjusted with the help of the stop. 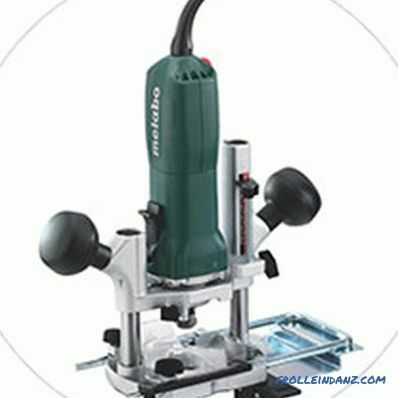 With the subsequent movement of the tool in a horizontal direction, the sharp edges of the cutter drill a groove. 1. Collet clamp for fixing the bit. 3. Step milling depth limiter. 6. Handle for fine adjustment of milling depth. 8. The mill case with the installed electric motor. 10. Handle for fine adjustment of the parallel stop. 13. On / Off button for router. 14. Parallel thrust adjustment screws. 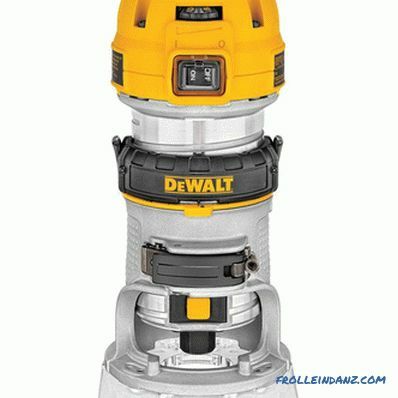 The capabilities of the router are largely determined by the power of the electric motor with which it is equipped. The greater the power consumption of the unit, the greater the maximum allowable diameter and length of the cutter that can be installed on it, the longer it will be able to work continuously without overload. It would seem that if you do not take into account the financial side of the issue, then the best frezer should be considered the most powerful. However, in fact, not everything is so simple. The increase in power entails a significant increase in the mass and dimensions of the engine, and hence the entire instrument. (power up to 750 W, weight 2-3 kg). (power 750-1500 W, weight 3-5 kg). (power 1500-2300 W, weight 5-6 kg and more). 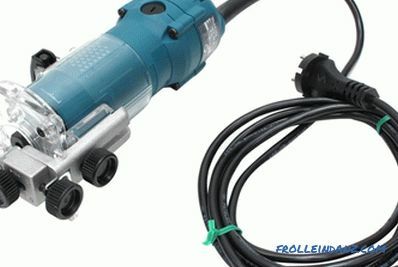 Specialists for regular milling work recommend a tool with a capacity of at least 1500 watts. Powerful frezer, of course, easy to cope with any professional tasks. However, when performing a number of fine works, for example, when processing the edge, it will not be easy to cope with a heavy and overall machine, especially for a beginner. 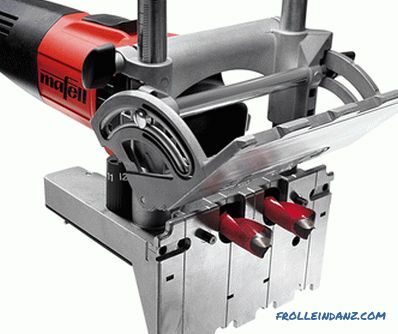 Your task at the tool selection stage is to analyze the intensity and nature of the work that is supposed to be performed using a router, and find the golden mean - a tool whose power will not be excessively large, but it is sufficient for the solution of objectives, long work without interruption, processing of strong breeds of wood. 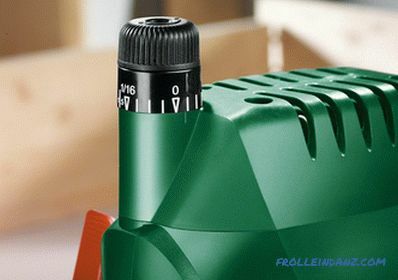 The significance of such a router bit, such as the spindle speed, is understandable even to the most technically unprepared users. The greater the speed of rotation of the cutter, the higher the quality of the machined surface. If high accuracy is required, it makes sense to work at lower revs. A small rotational speed is also needed when processing plastics; otherwise, the working area will overheat and, as a result, the material will melt. The spindle rotation frequency of most milling cutters lies in the range from 20 to 30 thousand revolutions per minute, however, they occur both more slowly (10-20 thousand rev / min) and faster (up to 35 thousand rev. . / min.) working units. It should be taken into account that the larger the diameter of the mill used, the smaller the angular velocity must be, since the linear velocity of the point on the periphery of the circle will still be high enough, and if the mill is “accelerated” even more, the tree starts to burn. Since the optimal spindle speed depends on the size of the mill currently used, the depth of processing and the density of the workpiece material, the ability to adjust the speed, which determines the functionality of the mill, will be very useful. Adjustment can be smooth or stepped (up to 8 positions). The operator chooses the optimal milling mode for these conditions, relying on his practical experience, however, manufacturers often indicate the recommended values ​​in the tool passports or on the mills. Milling cutter stroke, i.e. the maximum possible milling depth, is one of the most important parameters demonstrating the functionality of the tool. In light household milling machines, this indicator, as a rule, lies in the range of 20-50 mm, in powerful professional models it can reach 70-80 mm. The longer the stroke of the cutter, the deeper it can sink into the material being processed, the thicker the parts can be machined. The full-depth groove is usually not cut out at once — you can spoil the workpiece and damage the tool. At the same time, the harder the processed material, the less make the depth of a single pass. But in general, the groove with a depth greater than the working stroke of the cutter cannot be done. Many models of milling machines are equipped with a regulator for fine-tuning the depth of immersion; the accuracy of setting this parameter is usually 0.1 mm. Constant electronics . With an increase in the density of the material being processed or the speed at which the tool is carried along the workpiece, the turnover begins to fall. 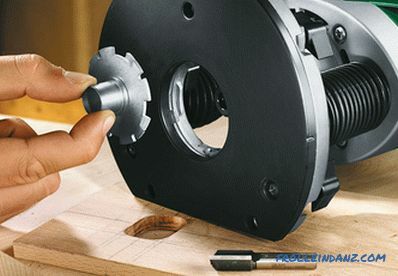 To maintain them at a given level will help the system of constant electronics, which controls the power of the electric motor to stabilize the speed of rotation of the spindle.The need for this function arises usually with large loads on the tool, so it is found, as a rule, only in professional milling cutters. Contact electronics allows you to maintain consistently high quality processing of the material. Soft start . Powerful professional milling machines are often equipped with a "smooth start" system. Thanks to this function, the engine grows gradually, which eliminates a sharp jerk snap when you turn on. Such a tool will last you longer, since its nodes do not experience periodic short-term overloads, it is safer to work with them, and the chance to spoil the workpiece at the very beginning of work is minimized. Overload protection system . 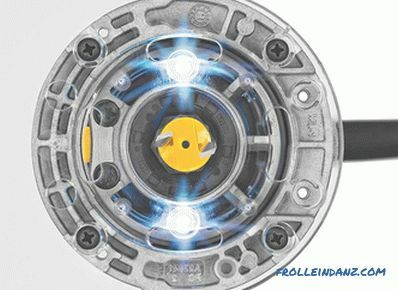 If the temperature of the motor winding exceeds the critical level, the overload protection system will take over. For different models, this function can be implemented in different ways - from simple light indication to automatic power off. 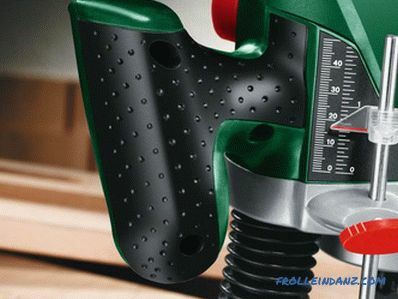 It is possible to find a router with an overload protection system only among professional models, since they are used during long-term intensive work, which means that they are more likely to begin to overheat as a result of increased loads. Protection against unintentional start-up . On the case of most modern milling machines, regardless of their price category, there is an additional button, without pressing which simultaneously with the main start button, the voltage on the motor windings will not be applied. Its main purpose is to prevent the router inadvertently starting. 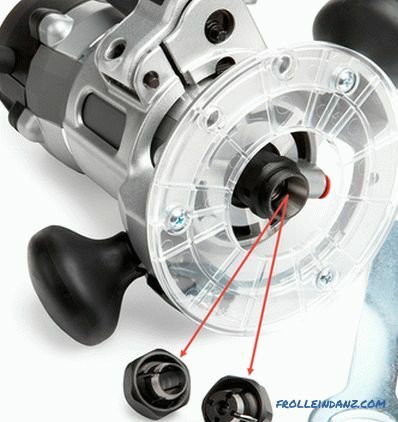 This button performs, as a rule, one more function - it allows you to block the triggering trigger in the on position. 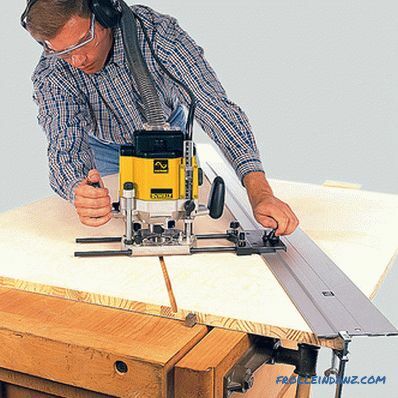 With stationary use of the router (milling table) one cannot do without such an option. Design features that need to be considered when choosing a router.
. elements of the instrument, so its quality should be paid special attention. The sole can be made either from cast or from stamped metal. The cast platform, thanks to its precise geometry and good adhesion to the surface of the workpiece, guarantees high quality work. Not surprisingly, it is considered a sign of high-end tool. The stamped sole is cheaper to manufacture, so it is usually installed on inexpensive household milling machines. The lower plane of the platform, i.e., the sole itself, is necessarily closed with a special overlay. This item is usually made of plastic. Most milling cutters have a plastic cover that is removable, making it easy to replace it when worn with a new one. When choosing a router, one should pay attention not only to the quality of the sole, but also to the size of the hole in it - the opening. It limits the maximum allowable size of the rig: you simply won't be able to install a large-diameter milling cutter on a unit with a small opening in the supporting platform. The mill head moves along two vertically arranged guide rods. The ease of use of the tool and the productivity of work depend largely on how easily and smoothly its movement will be. 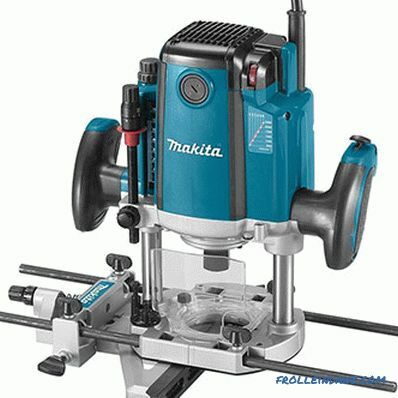 The presence of backlash and distortions, as well as excessive resistance to movement of the node in the vertical direction, is considered a serious disadvantage, since it complicates the use of the router. The depth of the cutter’s immersion in the material being machined is limited to a vertical stop. This metal rod rests on a special platform on the platform, not allowing the tool's head to drop below. By setting the milling depth, you simply move the thrust rod up or down. This can be done with a special screw. 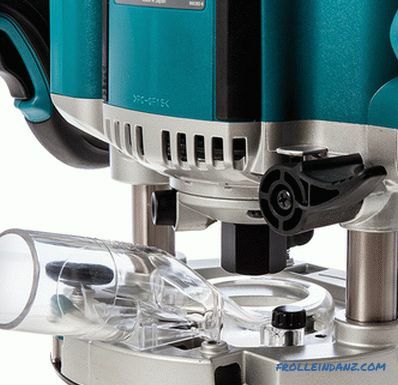 Advanced units also have an adjusting screw for fine-tuning the depth with a micrometric scale. The more precise the adjustment and the wider its range, the more high-quality and functional tool you hold in your hands. A multi-stage turret support will help make several passes with a gradual increase in the depth of processing up to the desired one. In fact, this is a special platform on a platform with several steps of different height, against which a vertical rod abuts, which limits the depth of milling. Sometimes the turret is performed in the form of several bolts screwed into the platform; in this case, the height of the steps can be corrected by twisting or twisting the bolts. The tooling of the manual router is secured to the spindle using a collet chuck.It is a special nut with a collet housed inside, screwed onto the spindle and a clamping shank of the inserted cutter. Light mills are designed for mills with a shank diameter of 6-8 mm, powerful ones, as a rule, are equipped with collets with a diameter of 10-12 mm. The latter is easily explained: the larger the mill, the thicker its shank and, at the same time, the higher the requirements for the power characteristics of the tool. The diameter of the cutter must match the diameter of the collet. However, it is still possible to install a milling cutter with a thinner shank in the nest of a larger diameter. To do this, you will have to use a replaceable collet (or, in extreme cases, a special adapter sleeve). Even if it is not included in the tool kit, it can always be purchased separately. With such a "change" of the cutter, you should carefully monitor that the recommended rotational speed matches the tool, otherwise the thin shank may not withstand excessive load. A quality collet reliably fixes the shank strictly along the axis of the spindle, which eliminates the appearance of vibrations that adversely affect both the quality of material processing and the state of the tool. Collet clamps with a large number of clamping tabs are preferable, since they center the cutter better. The milling cutter is rarely used for rough fitting of the workpiece, more often the filigree accuracy is required from the tool (and the operator working with it). All sorts of assistive devices that make working with the router easier and more convenient come to the rescue. A parallel (side) stop is used for milling parallel to the edge of the workpiece. 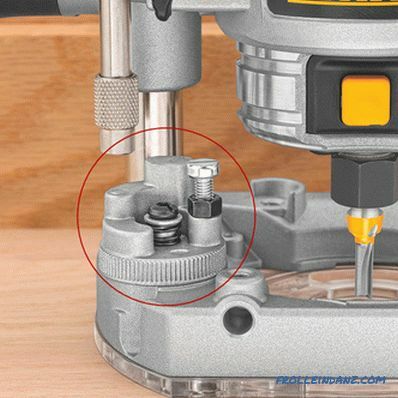 It allows you to evenly guide the tool at a given (relatively small) distance from the edge. 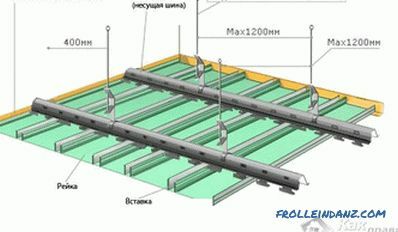 It is fastened to the base of the instrument by means of two rigid steel rods, which are fixed on the sole with screws. The quality of work ultimately depends on the rigidity of the resulting structure. A parallel stop is made of cast or extruded metal, isolated from direct contact with the workpiece with a removable plastic lining. The guide tire is also used when milling in a straight line, but unlike the side stop it can be installed at any distance from edges of the workpiece and at any angle to the edge. It is a profiled ruler attached to the workpiece with clamps. A special shoe is connected to the router, which moves along the grooves of the tire and guides the tool. The copy sleeve is used for milling along a complex path by copying the contours of the template. 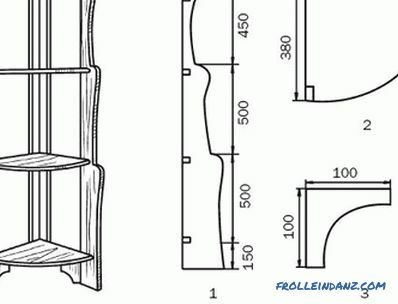 During operation, the collar of the sleeve rests against the edge of the template, as a result, the cutter reproduces its contour on the workpiece, and you get a slightly enlarged copy of the product used as a template. 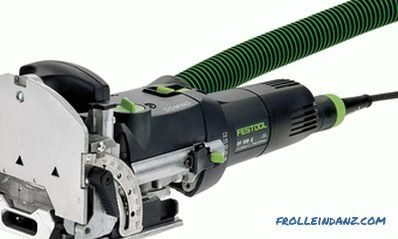 The sleeve is selected under the diameter of the cutter, is fixed by means of the quick-clamping mechanism. The compass ruler helps to mill the workpiece along a radial line. 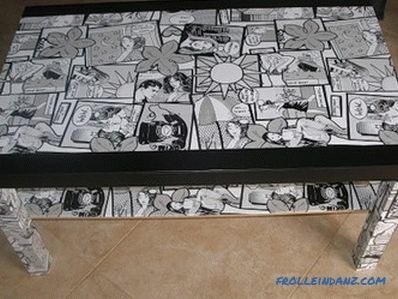 With it you can make, for example, a rounded table top. One end of the compass ruler is fastened with screws to the bit of the router, the other is fixed with a pin in the hole drilled in the workpiece in the center of the circle. The nozzle for connecting the vacuum cleaner is an element in which today, probably, no one doubts. Allows in the course of work to keep the cutting area clean, and therefore well visible. We hope that your knowledge about milling machines, thanks to our efforts, has been significantly replenished. 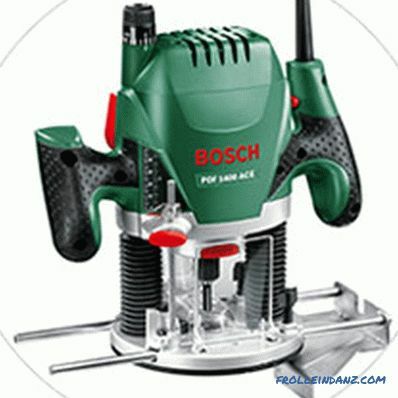 But did the question clarify for you which manual wood router to choose? If still not, let me give you some practical recommendations so that you understand the criteria you need to focus on. Tip # 1 . Choosing a high power mill, you choose high performance and the ability to work for a long time with significant loads. However, you should not mindlessly chase the large value of this indicator. Remember that at the same time as the power increases the weight of the unit - it will not work so easily and comfortably. It is necessary to compare the advantages of high power with the disadvantages of using heavy tools to perform fine work. However, if you plan to use the router in a stationary position (milling stand or milling table), high power will be an undoubted advantage. Tip # 2 . 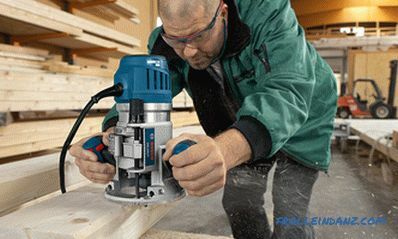 Pay attention to the fact that your chosen router has the ability to adjust the spindle speed.The speed switch at the ideal tool must move in steps or at least rather tightly and be in a place where the chance to touch and shift it is accidentally minimized. Tip # 3 . Be sure to check the actual depth of the cutter, which can vary greatly depending on the design features used collet clamp. It is great if the collet reaches the bottom of the support platform, but ideally it should stand for the base. This characteristic strongly influences the functionality of the tool, but in the passports the “departure” for the sole, alas, is not indicated - you can find out its value only by holding the router in your hands. Tip # 4 . Test the operation of the pin mechanism. The head of the tool should go freely and without distortions, and the vertical stop should be securely fixed in a given position. Ensure that the accuracy of the immersion depth setting meets your requirements. Tip # 5 . Find out the snap of what diameter and geometry can be used with this mill. To do this, you need to compare the size of the cutter with the diameter of the opening in the sole, as well as in accessories (copy sleeve, ruler, compass, etc.). Do not forget to compare the diameter of the shank cutters, which you intend to use, with the fit size of collet. Tip # 6 . Rate tool ergonomics. It is important to choose the most convenient type of handle for you. There are not so many options - pistol and mushroom. Opinions of experienced users regarding the location of controls, in particular the immersion depth stop, were divided - some believe that there should be no buttons on the handles; others, on the contrary, prefer to have switches in the most accessible place, in order to use them if necessary without interrupting work. From our point of view, the most suitable place for the stopper lever is near the handle, within the reach of the fingers, but not on the handle itself. However, it does not make sense to listen to anyone's advice on convenience: what is convenient for one may not fit the other. It is necessary to hold the model you like in other hands in your hands and appreciate the convenience of the location of controls. Also pay attention to the length of the cable - a short power cord causes a lot of inconvenience in the process. Tip # 7 . If you plan to work frequently without guides, a good view of the working area will be very important. It also depends on the size of the opening in the sole, the location of the pipe for dust removal, the presence of LED backlighting. Tip # 8 . Find out how accessible the auxiliary elements are for your chosen model, whether it is possible to replace them with analogues from other manufacturers. Tip # 9 . If possible, test the selected frezer at idle and under load. Extraneous noise and increased vibration are a sign of poor-quality assembly or problems. Tip # 10 . 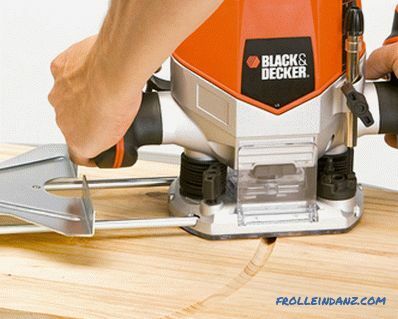 Undoubtedly, price is an important criterion for choosing an electric router. Here we can not give any advice. We must understand that a good tool can not be cheap. If your budget is limited, try to evaluate which features you are willing to pay for and which ones are not particularly important to you. 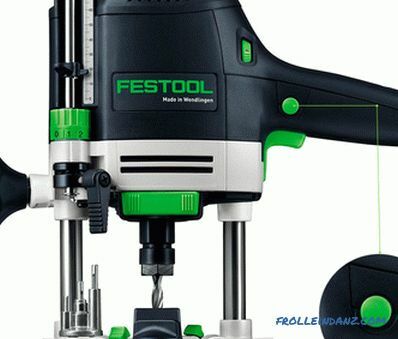 Whatever frezer you choose, so that the joy of acquiring it is not overshadowed, remember the main rule when working with power tools: go slower - you will continue. Haste is fraught with injuries, tool breakage or, at best, damage to the workpiece. Disconnect the router from the power supply before replacing the equipment. Secure the workpiece with clamps. These operations take a few seconds, and we strongly recommend that you do not save time on it. You should not try to remove a thick layer of material in one pass: you are unlikely to like the quality of processing, and the cutter may not withstand increased loads. And, of course, do not take half an hour or an hour to carefully read the instructions before starting work. 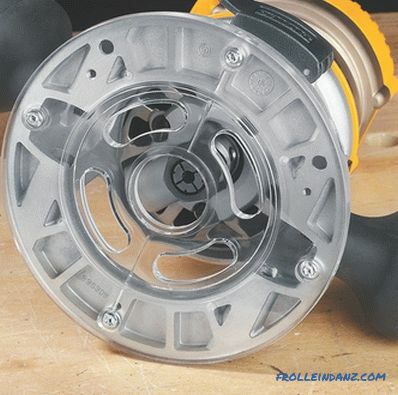 Even if you have experience with such a tool and you feel like a cool pro, you should not neglect reading the instructions, because, first, you could forget something, and second, each model may have its own specific .